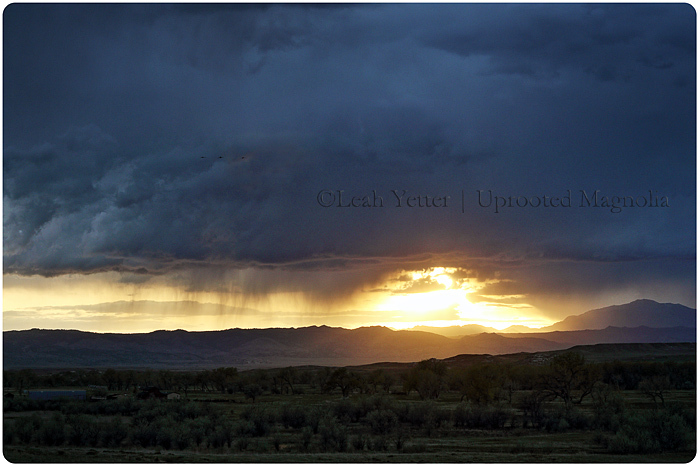 Clouds briefly opened up at sunset during a downpour over the hills last night. We have more storms on the horizon for today. Might be a wet weekend for us here in the wild west. It’s been a very wet spring so far with more rain to come. The Laramie River is high and rapid and is crashing against the bank. It’s pretty spectacular. Beautiful light at sunset during a rainstorm last evening. It was such a peaceful and sweet sound. Have a wonderful weekend! It’s a busy one for us, how ’bout you?